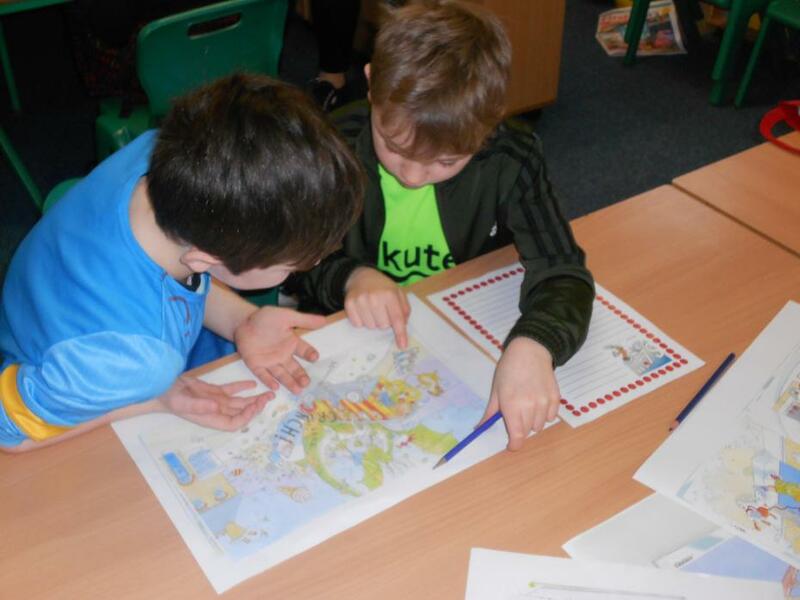 As part of our topic we had a Mediterranean day to be able to get a feel of the different cultures in Spain, Italy and Greece. 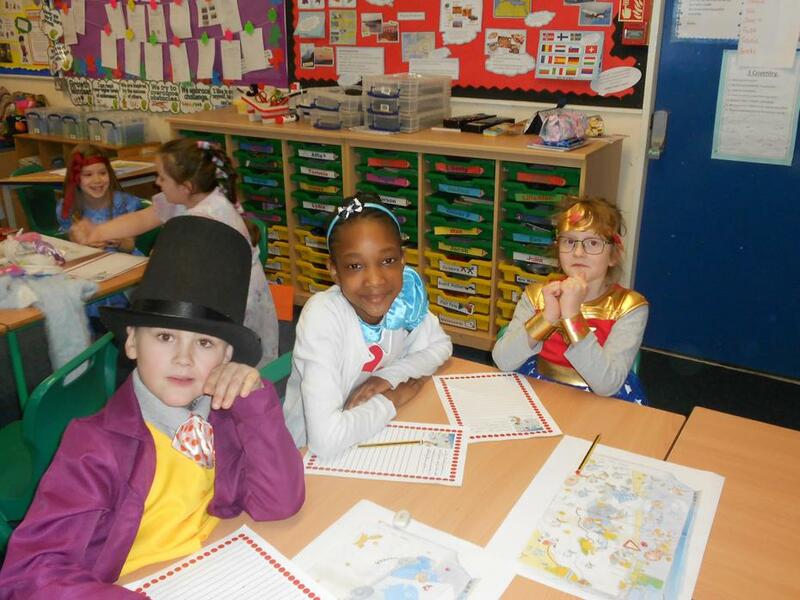 We got to try foods from the different countries, tried speaking the language, had a go at a traditional dance and looked at some of the famous landmarks in the countries. 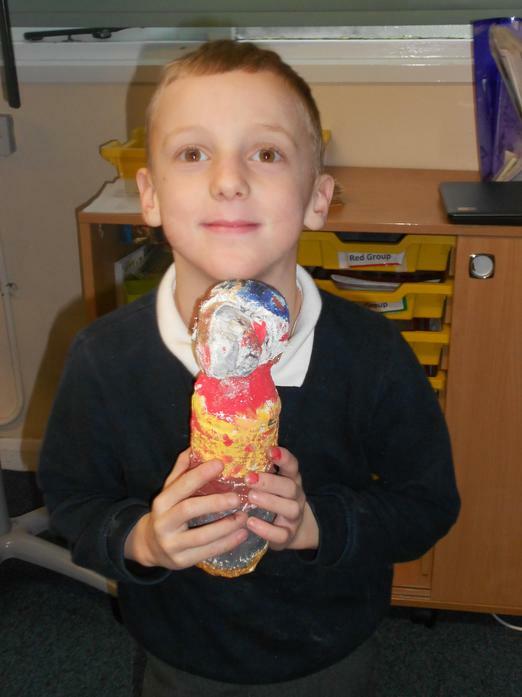 These pictures show us trying a Spanish Tortilla and flamenco dancing. 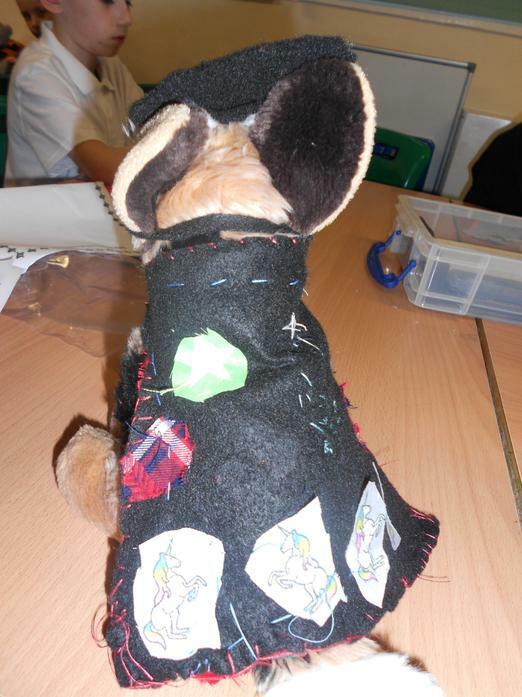 Linked to the book we have been working on in English Leon and the Place Between we designed and made a magicians cape for a teddy bear. 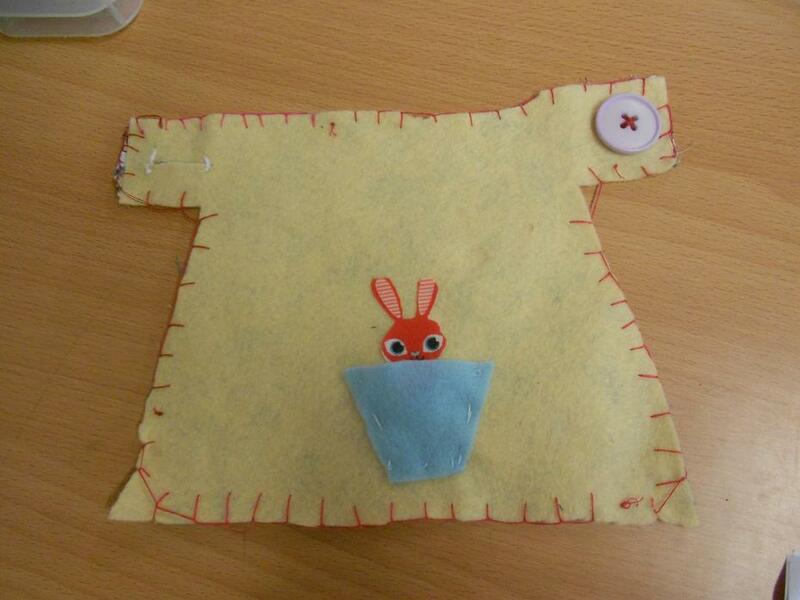 We learnt how to sew running and blanket stitch. 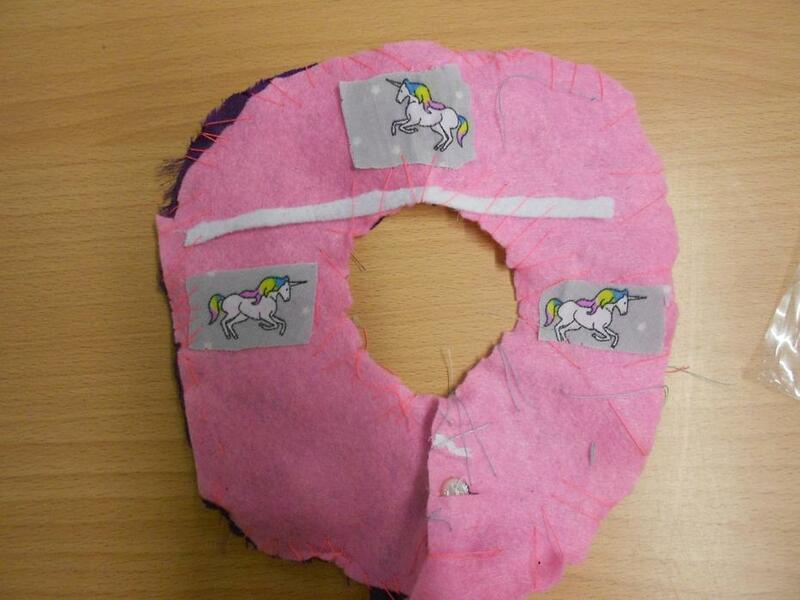 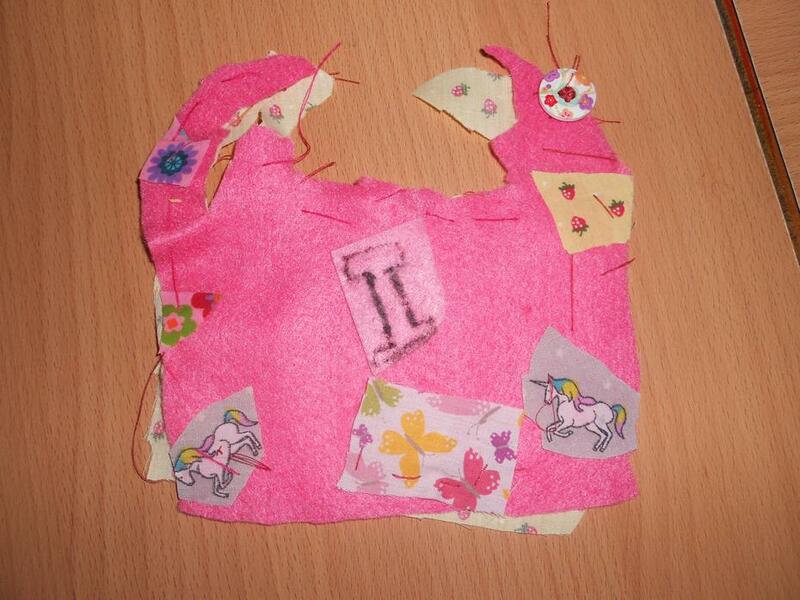 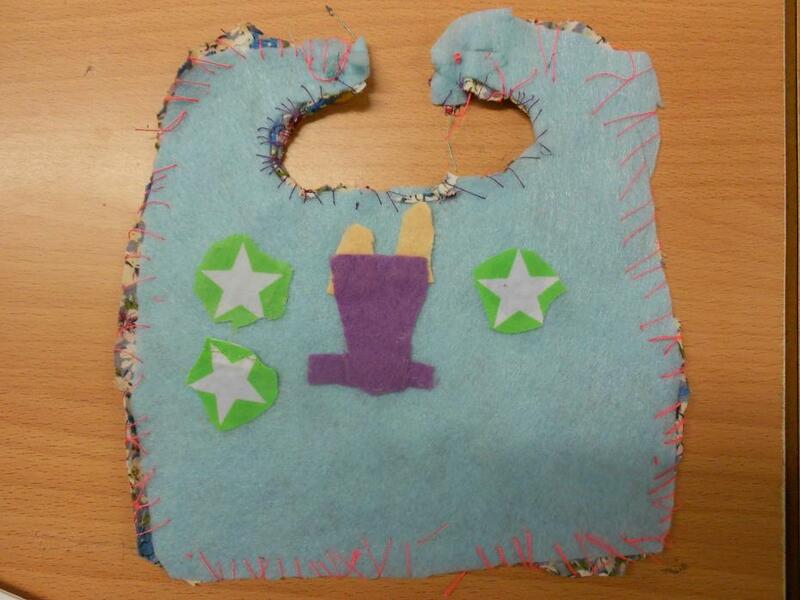 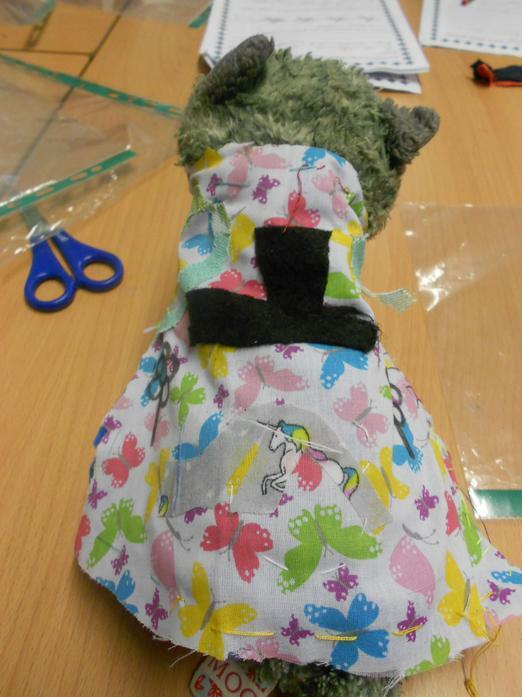 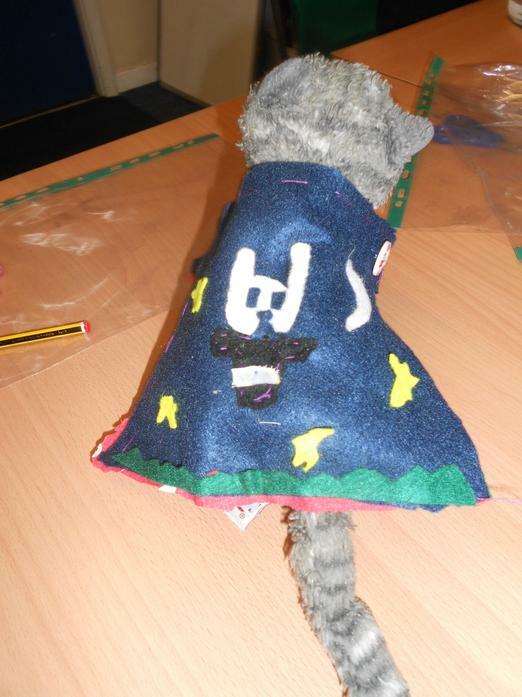 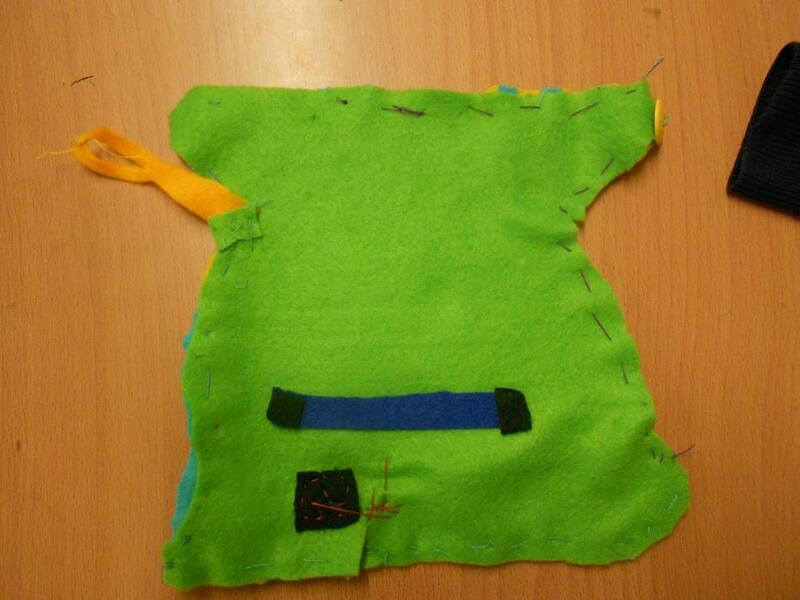 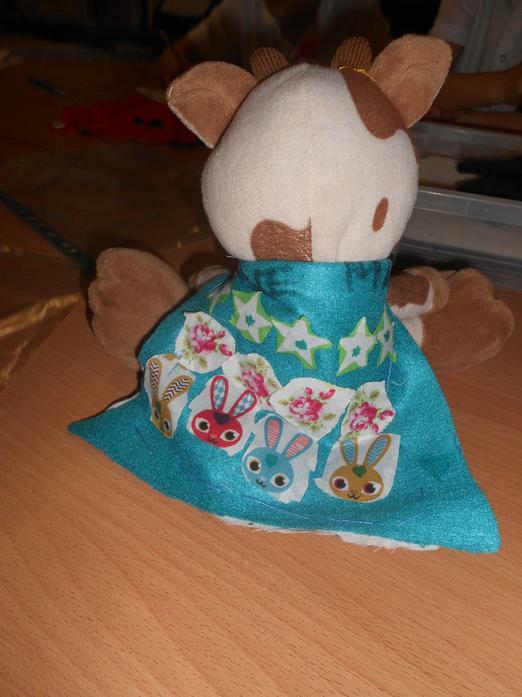 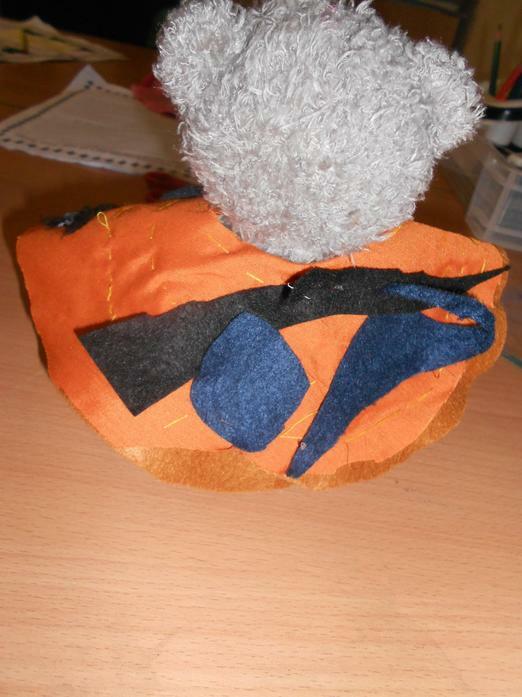 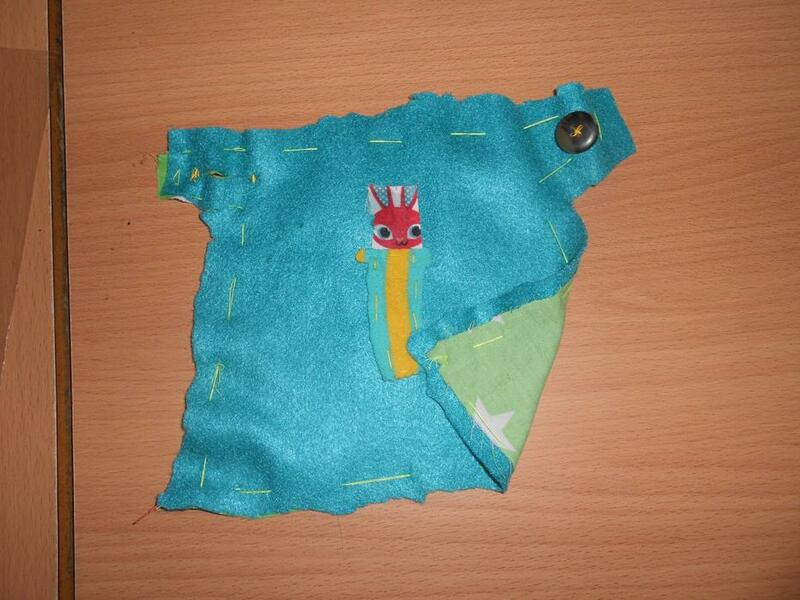 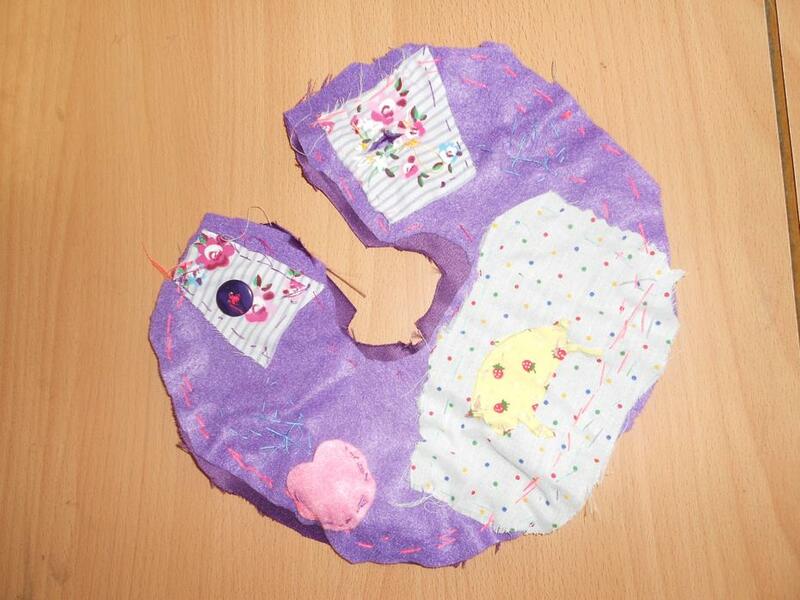 We used the stitches to sew two pieces of fabric together, add decorations and sew on a button. 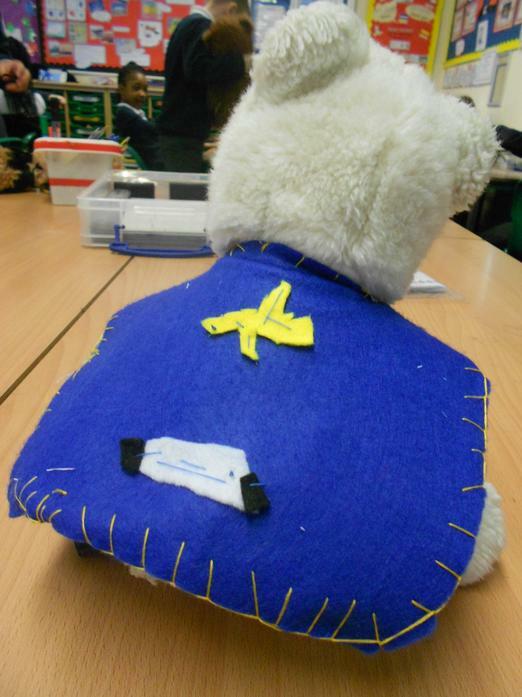 Once finished we tested them on our teddies. 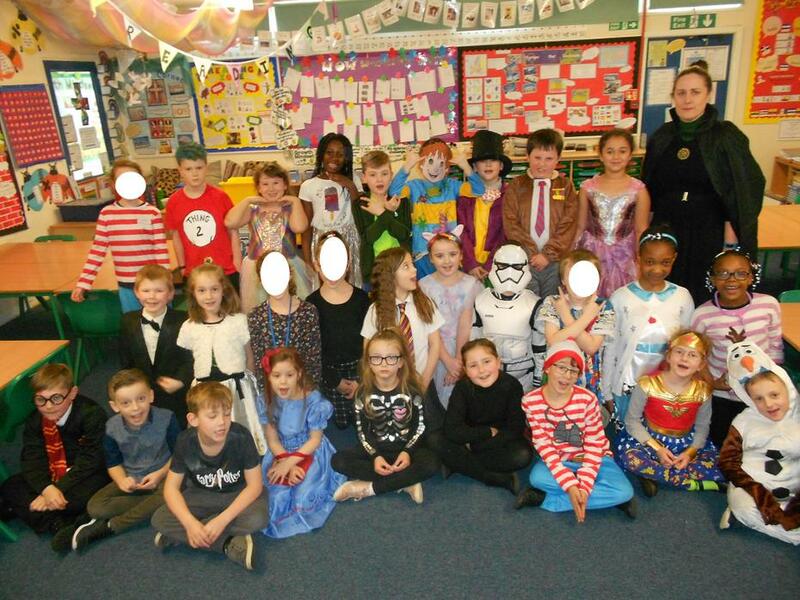 We came dressed up as different characters for World Book Day. 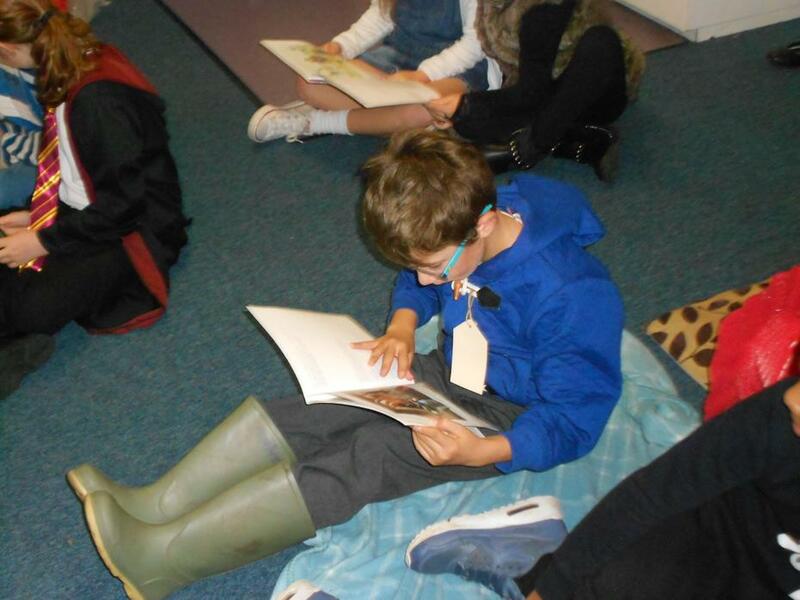 We visited different classrooms and listened to teachers reading their favorite picture book. 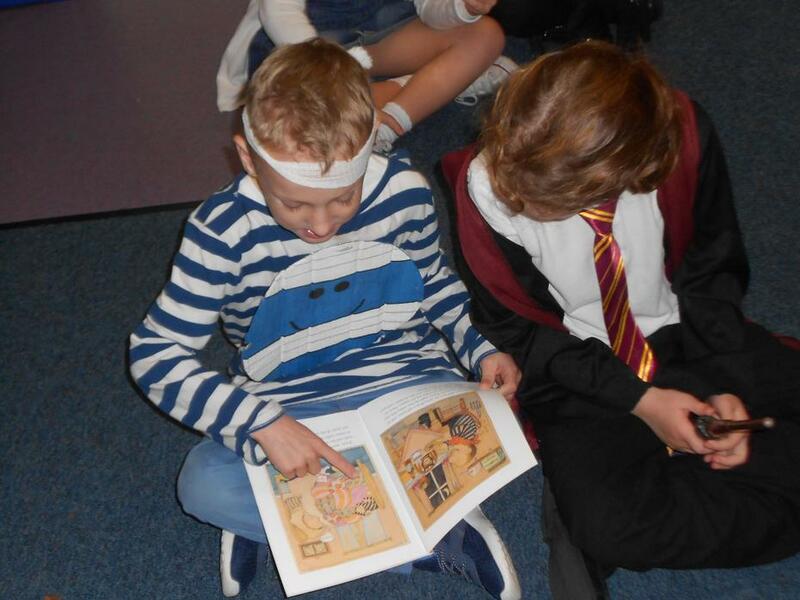 Then we looked at Mrs Bennett's favorite picture books which was Slam by Adam Stower, it was just pictures and no words! 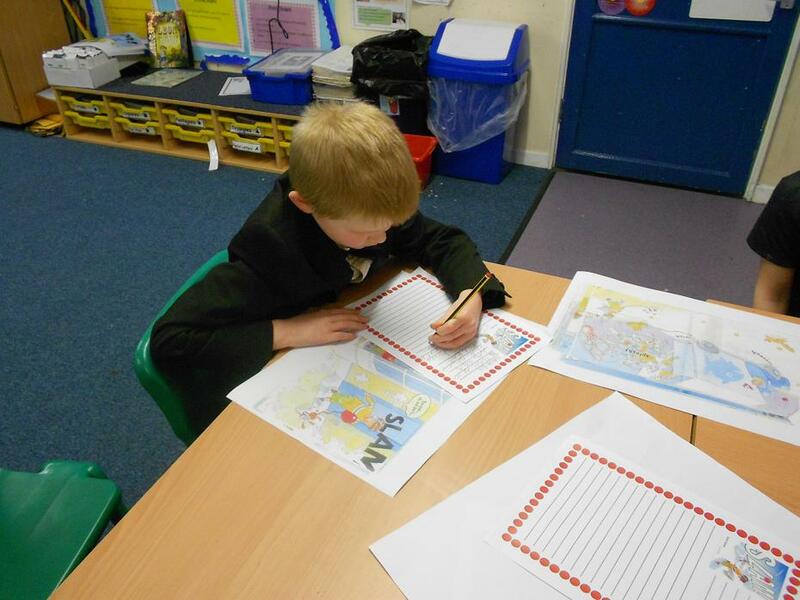 We picked our favorite picture and wrote what writing for that picture might have been. 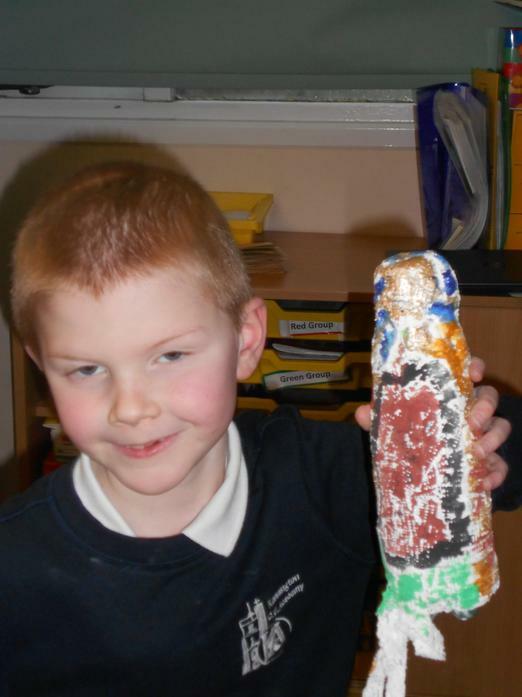 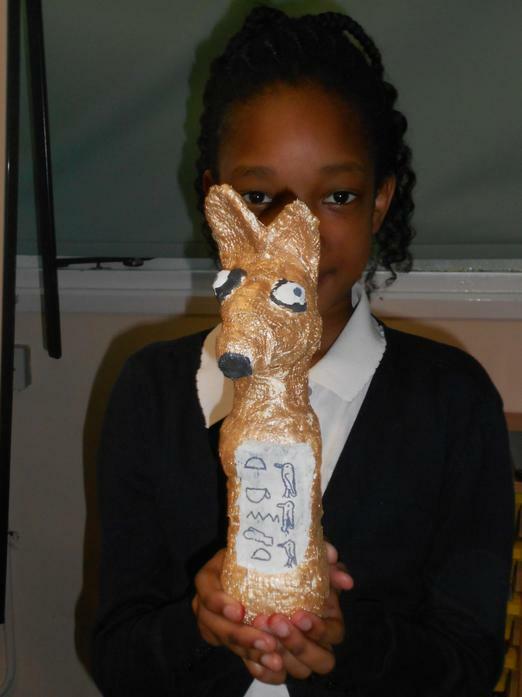 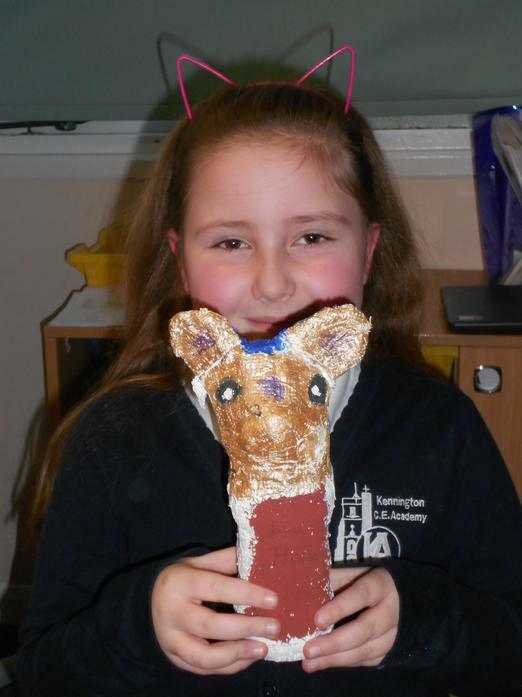 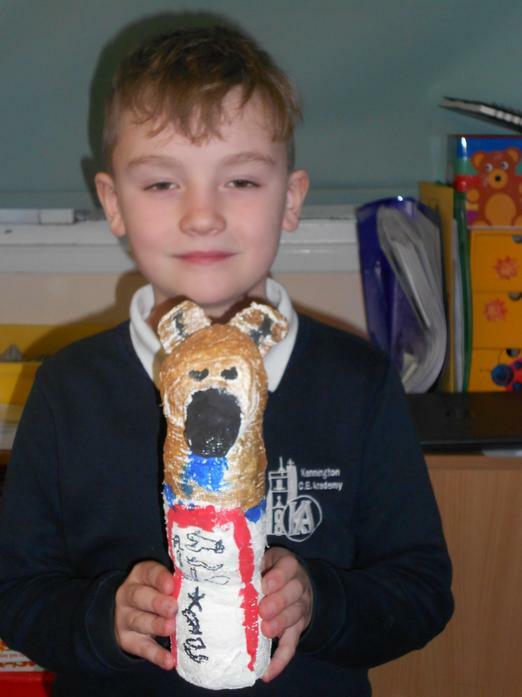 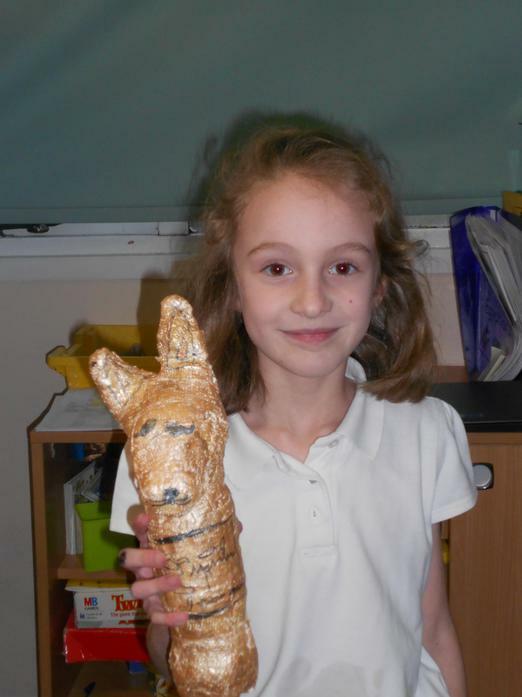 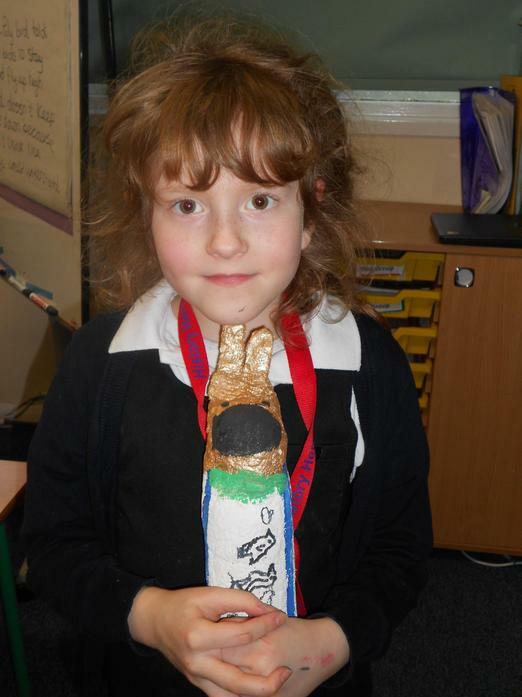 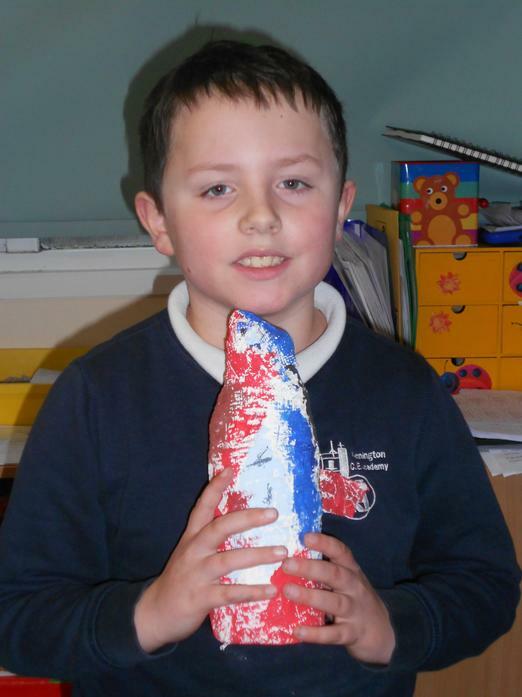 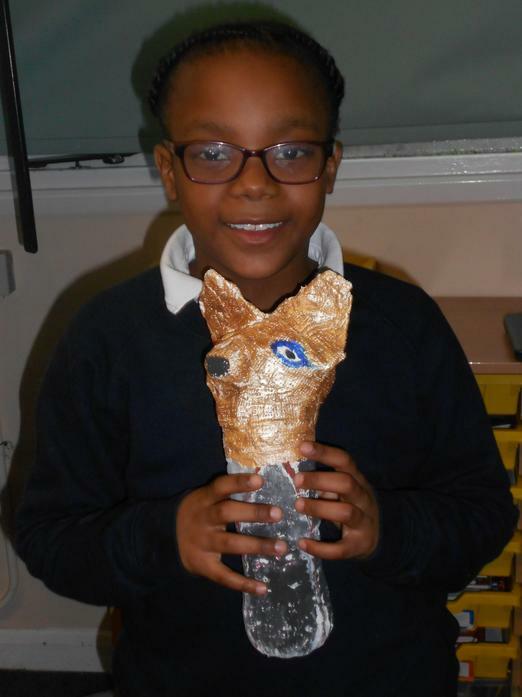 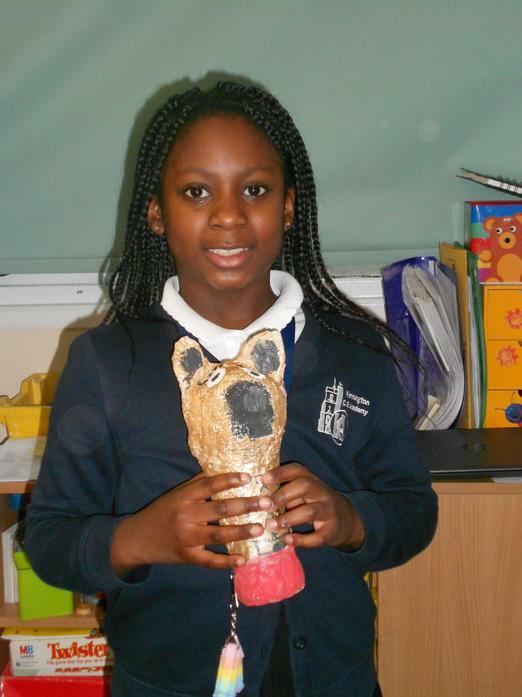 In art children have been working hard to create a sculpture of a canopic jar. 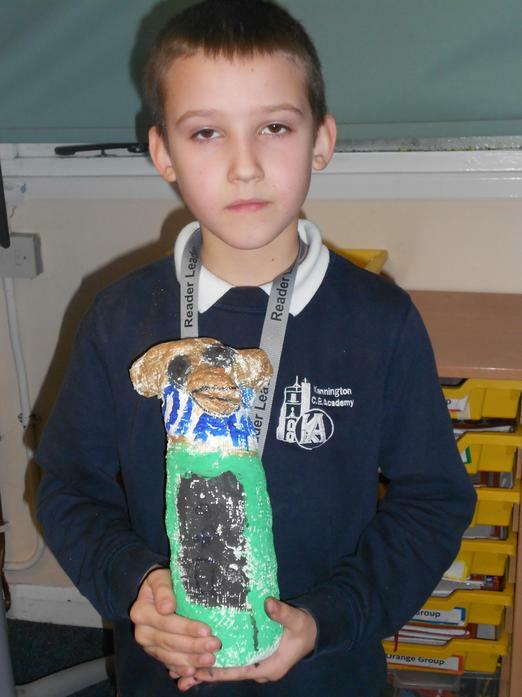 They first shaped materials (newspaper, foil and masking tape) to make the armature of the head for the jar. 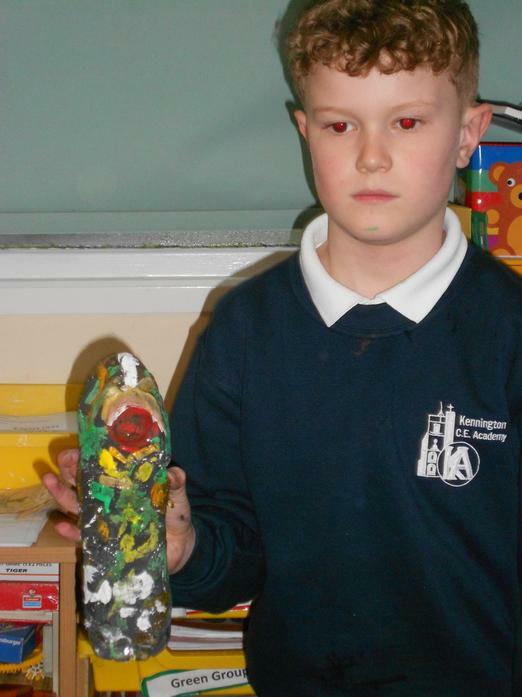 Using Modroc they covered the whole armature to create a hard sculpture. 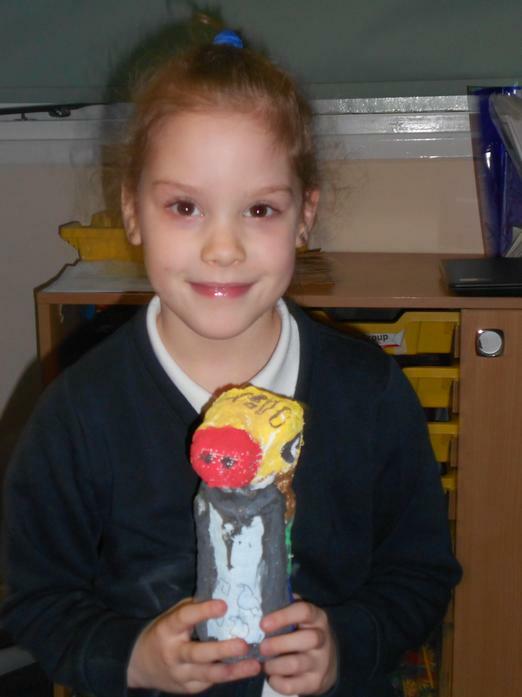 Finally they painted the jars, using suitable colours, and added detail using pens. 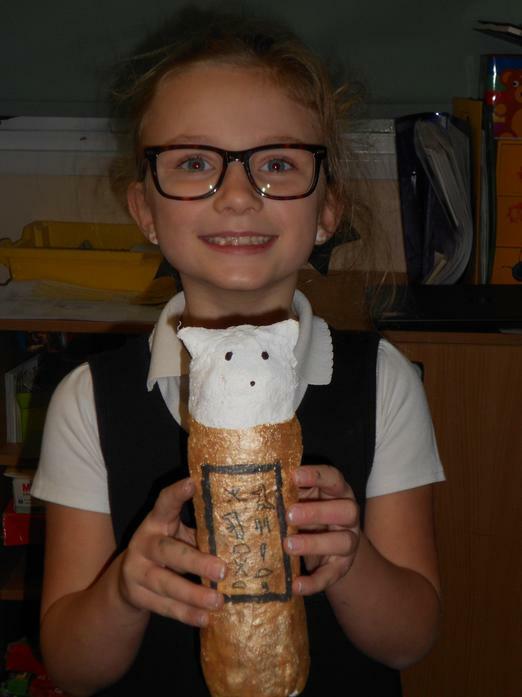 The final jars look amazing they have done so well. 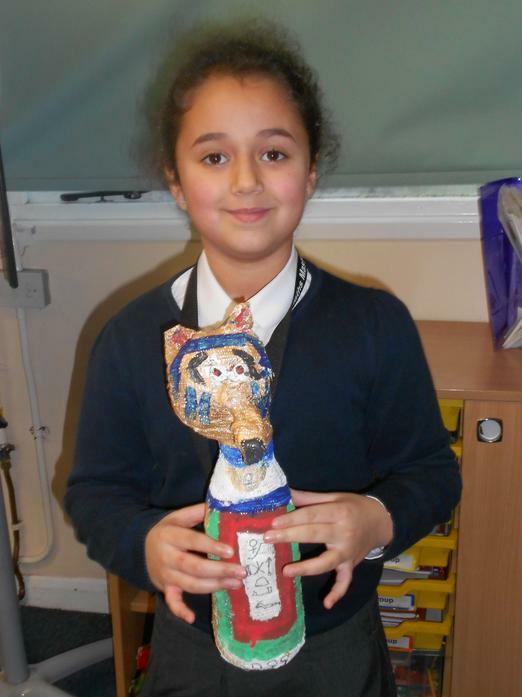 Can you work out which Egyptian god the jar represents? 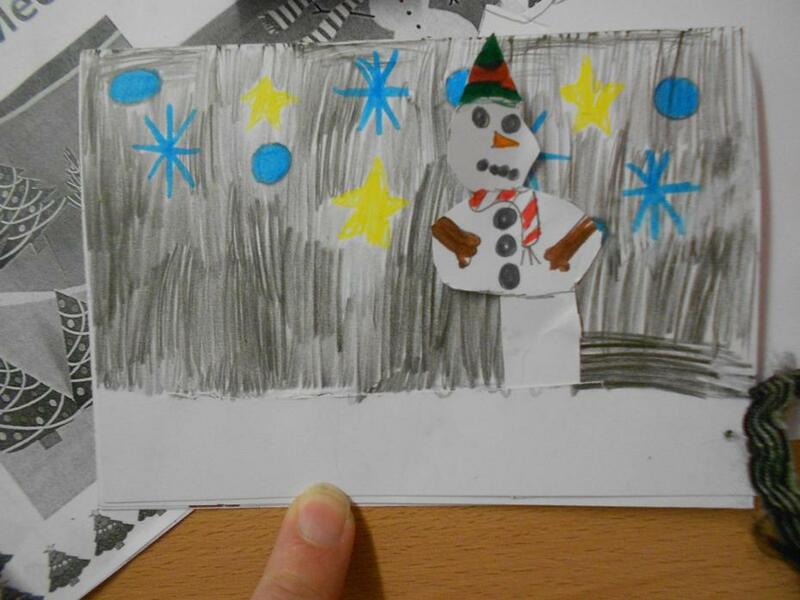 During theme week the children used Scratch to create their own animations of a snowman. 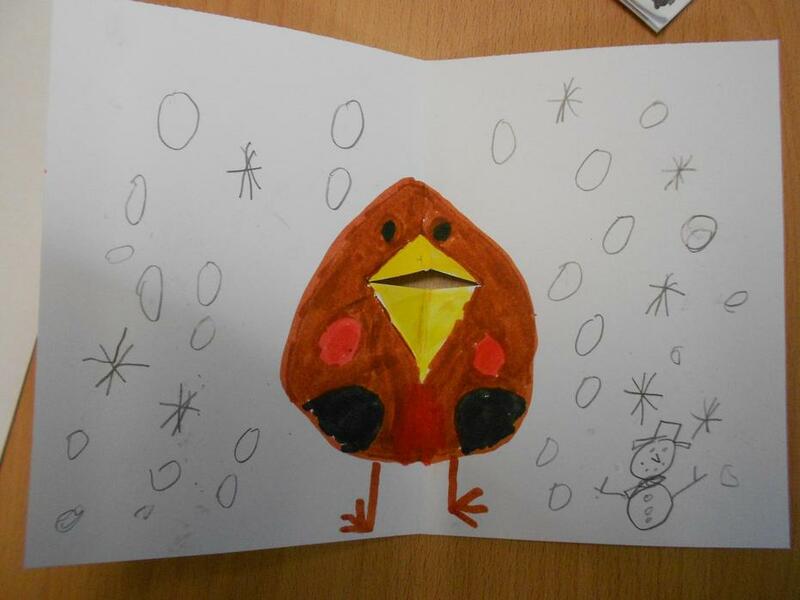 They drew the snowman character and then added coding to make the character move and change. 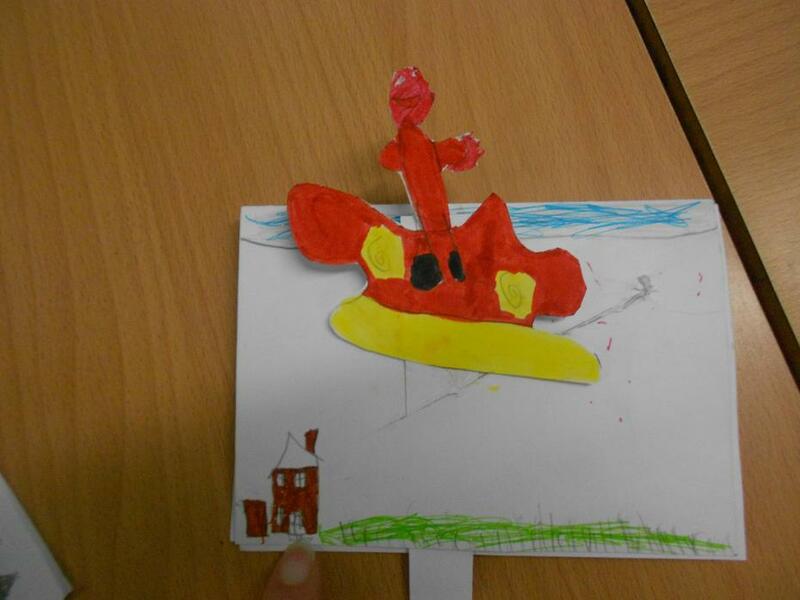 As part of their DT unit the children investigated different types of moving parts such as sliders, pull levers, flaps and pop-ups. 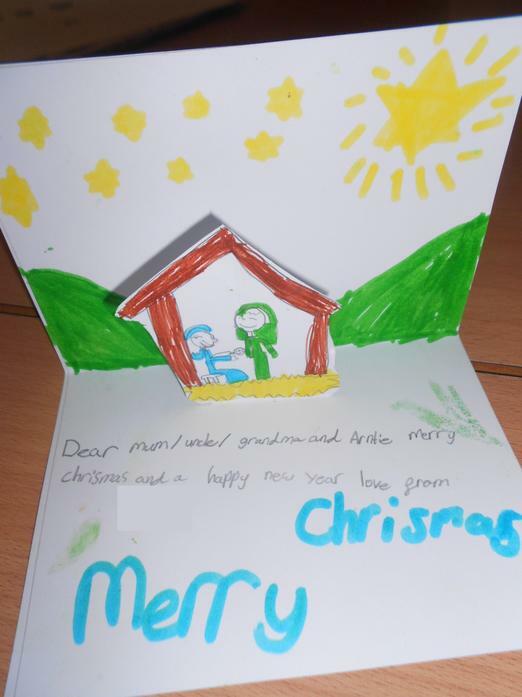 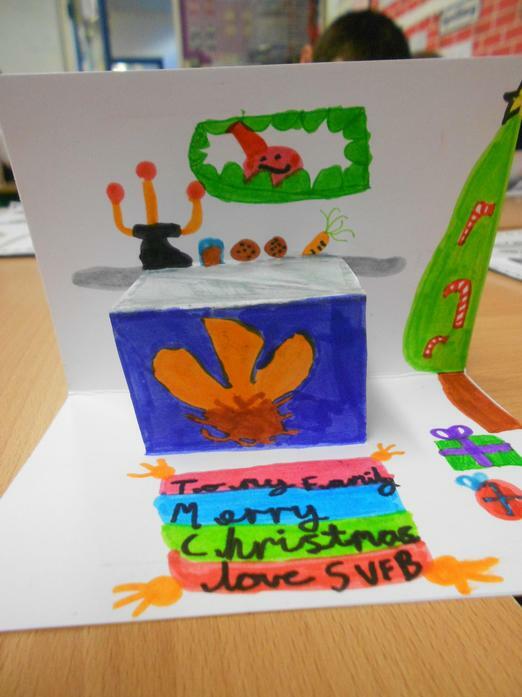 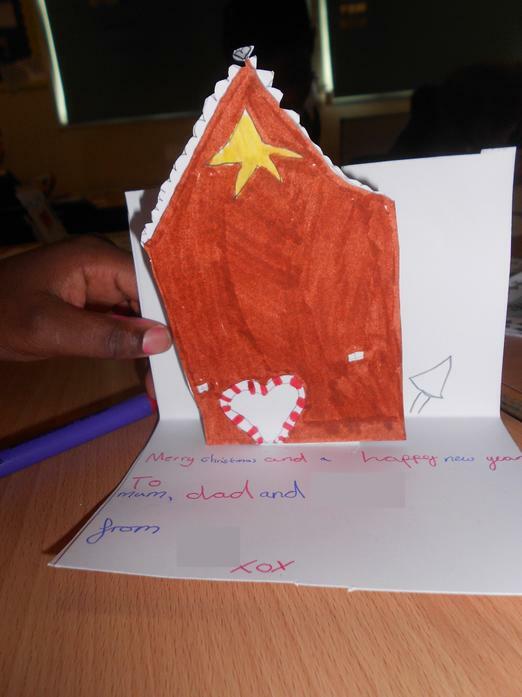 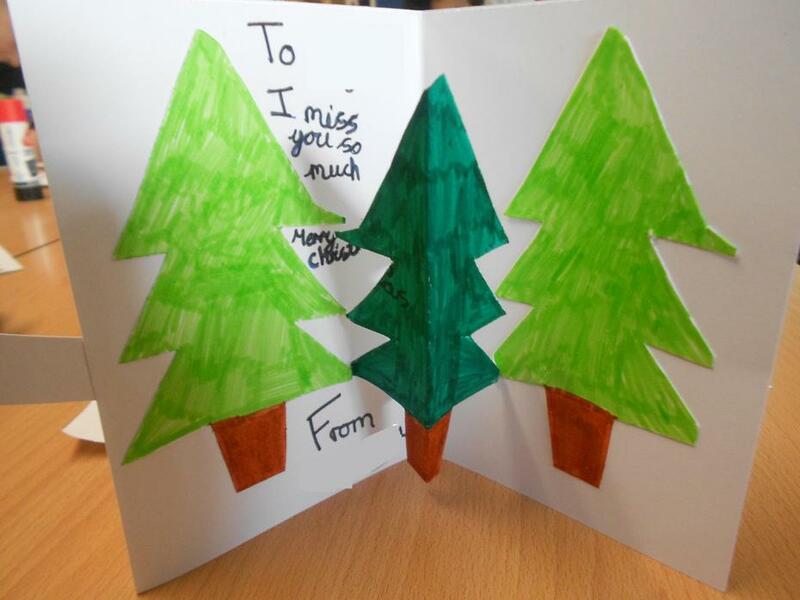 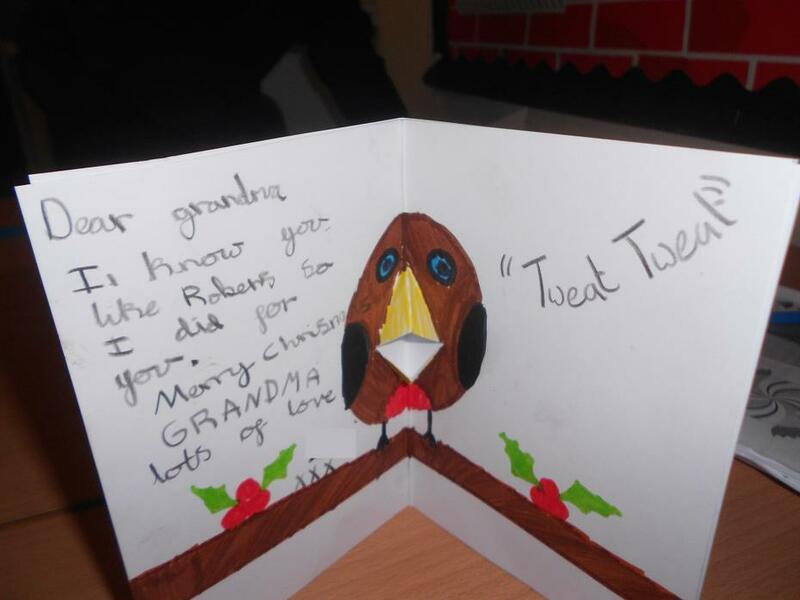 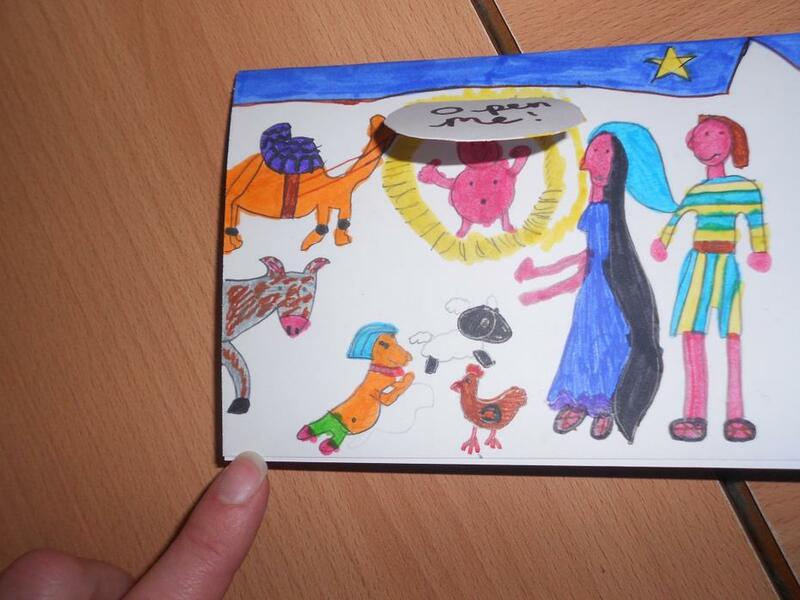 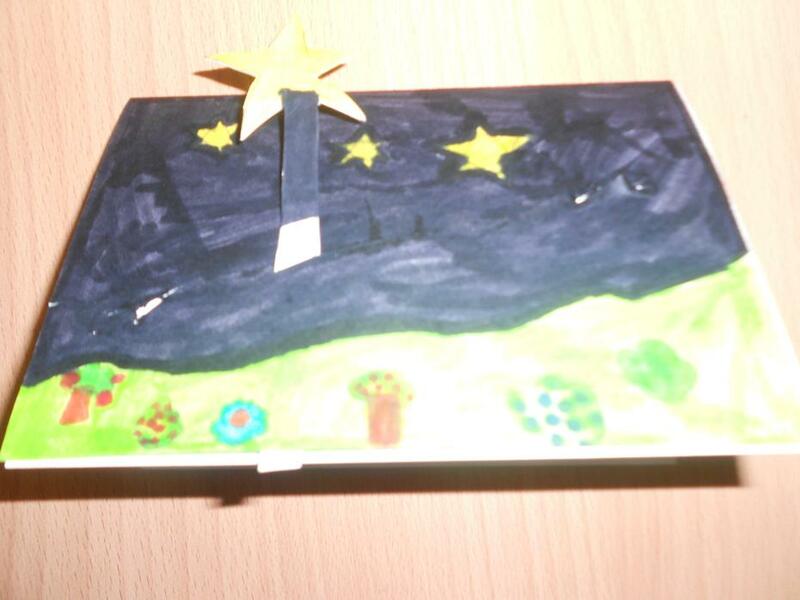 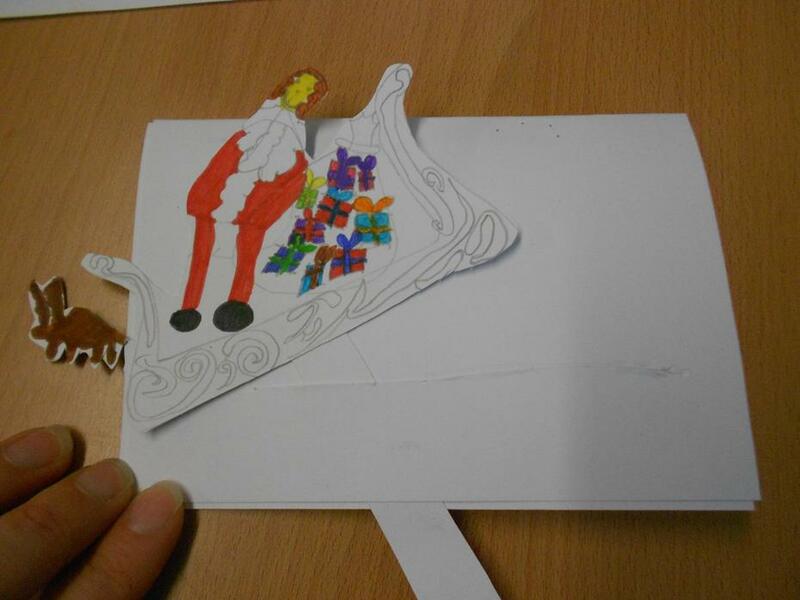 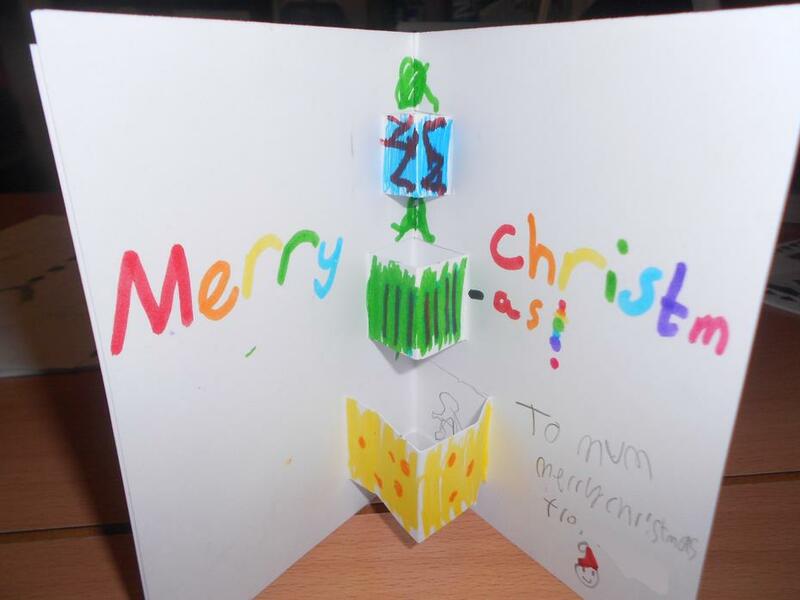 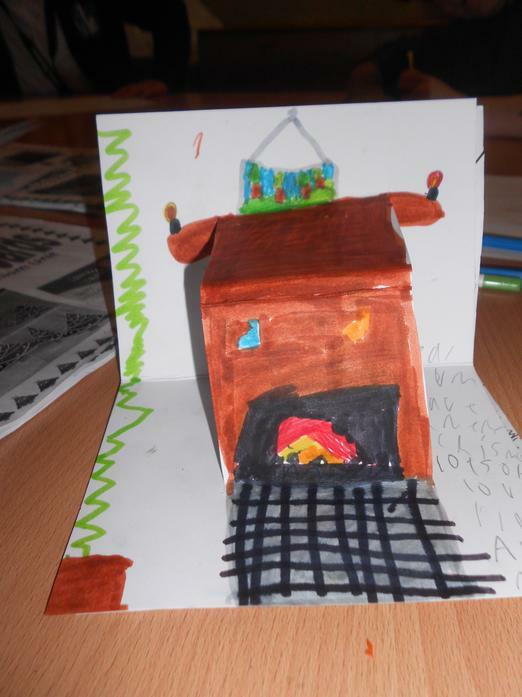 They then used these ideas to design and create their own Christmas card with moving parts. 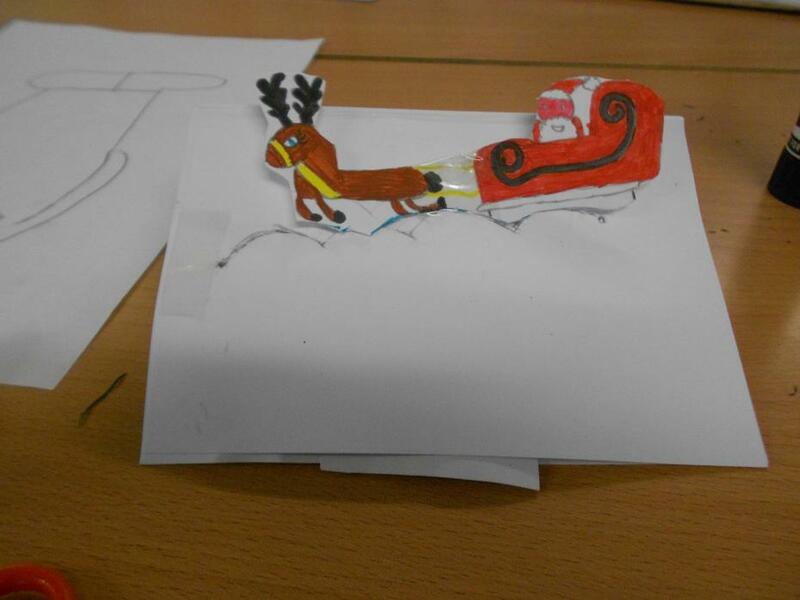 These are some of the final designs from the class. 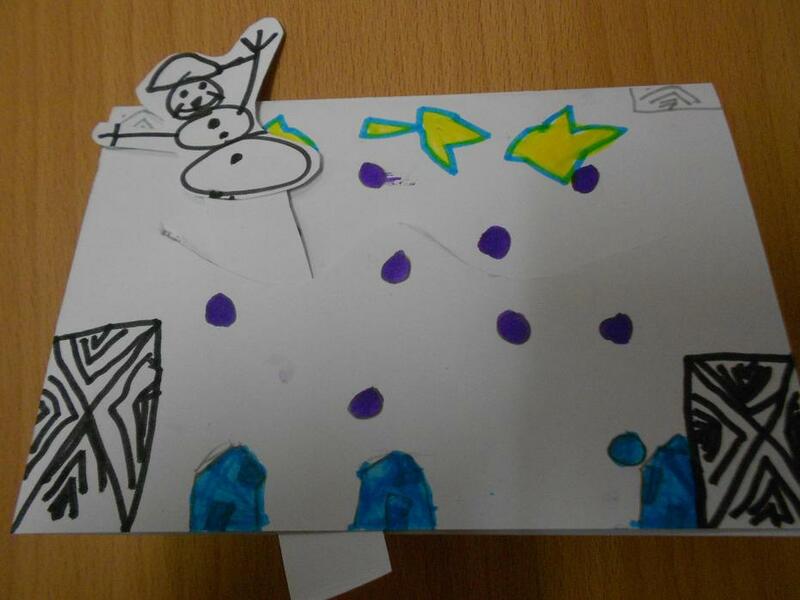 After introducing the story Stone Age Boy to the class they then turned the desks into caves. 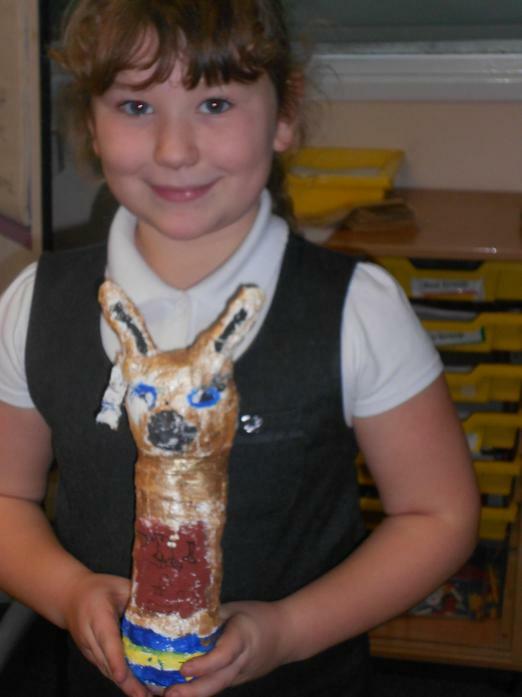 Once inside their caves they drew pictures to tell the main events of the story int he style of cave paintings. 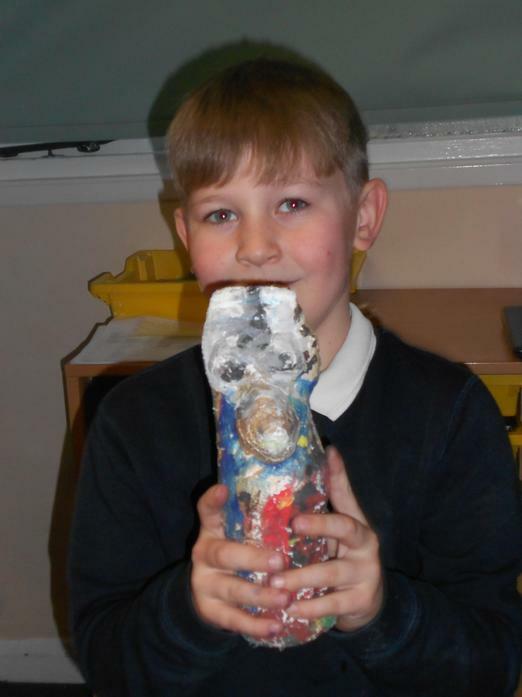 To imagine what some of the activities Stone Age Boy completed in the story the children threw javelins at a target to imagine they were hunting reindeer, they tried chipping stones to make tools, sewing and rubbing sticks to create a fire or clicking stone together (not that we managed to make one). 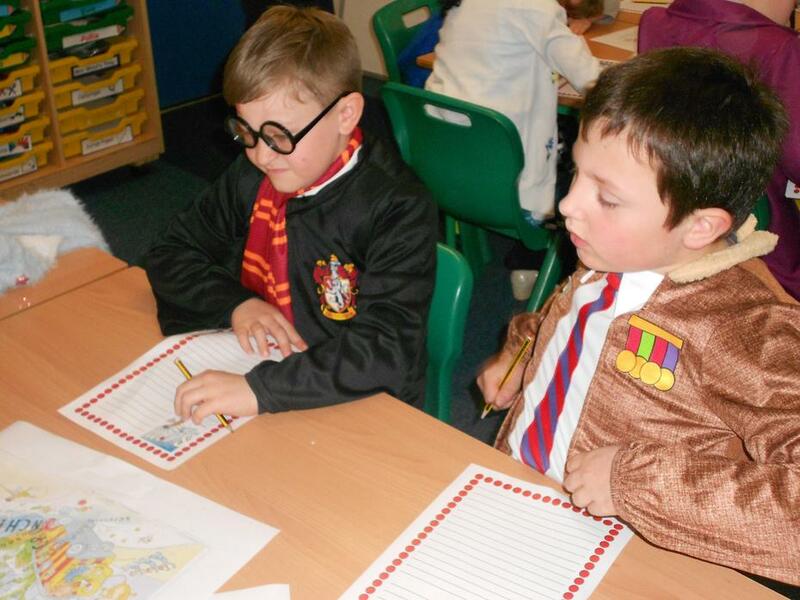 Through these activities the children gathered a range of verbs and adverbs to describe the actions. 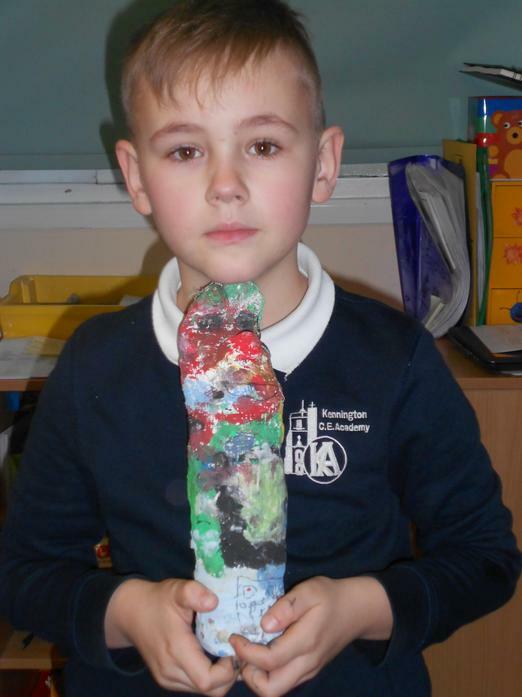 After discussing what love and care can mean, what it means to them and how they can show love and care children worked independently or collaboratively to produce a piece of art work. 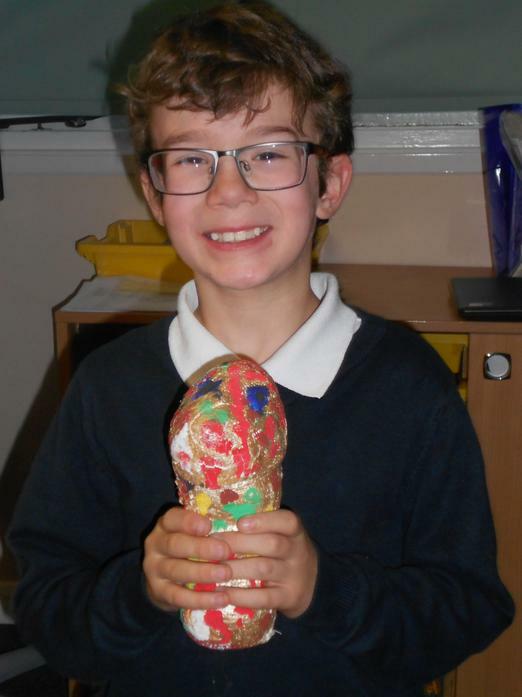 The art work inspired by the school Christian value Love and care will be used to create an exhibition in our local church for the community to come and view. 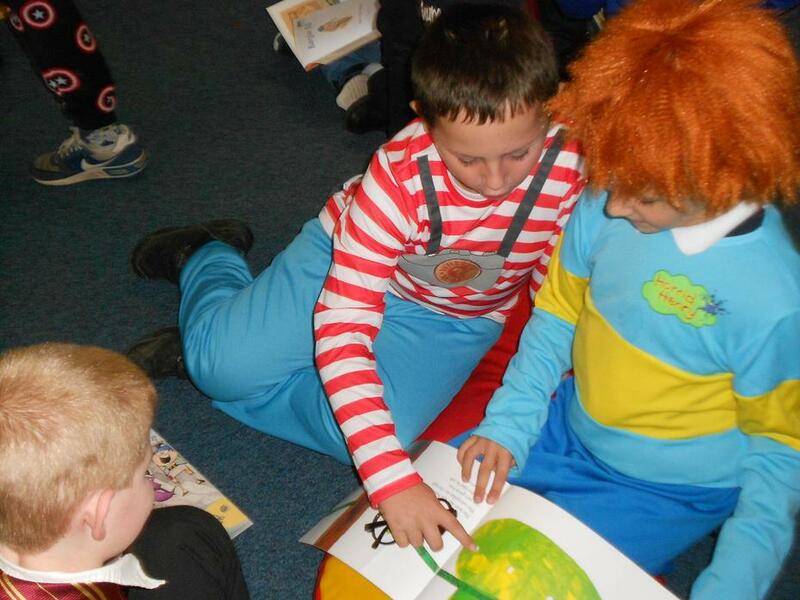 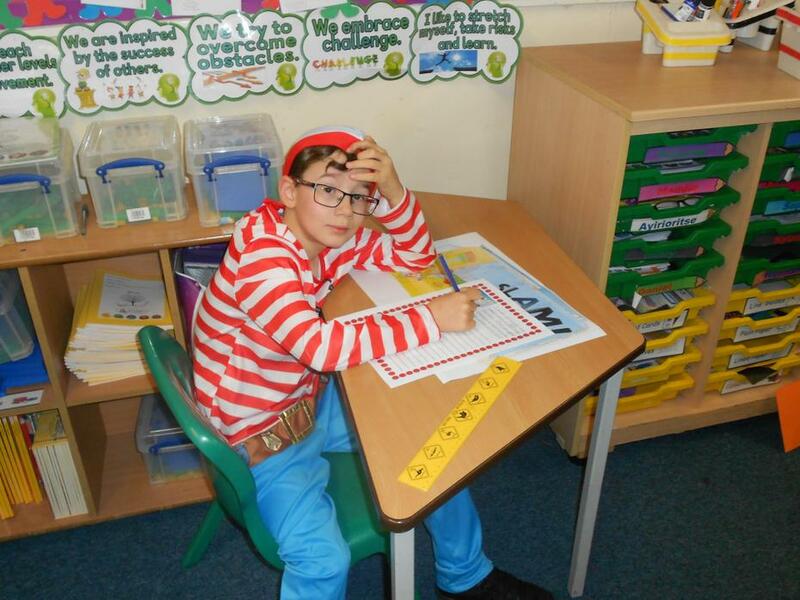 On reading day children came in dressed as their favorite reading characters and looked fantastic. 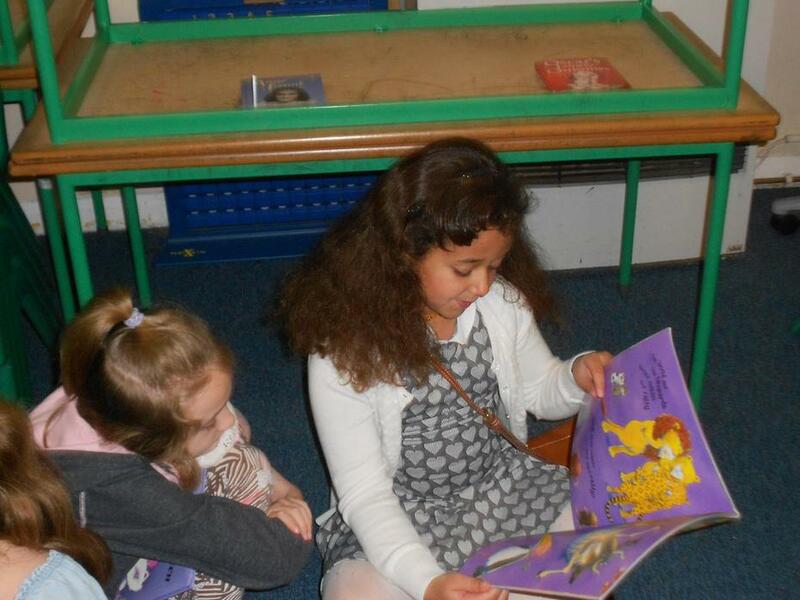 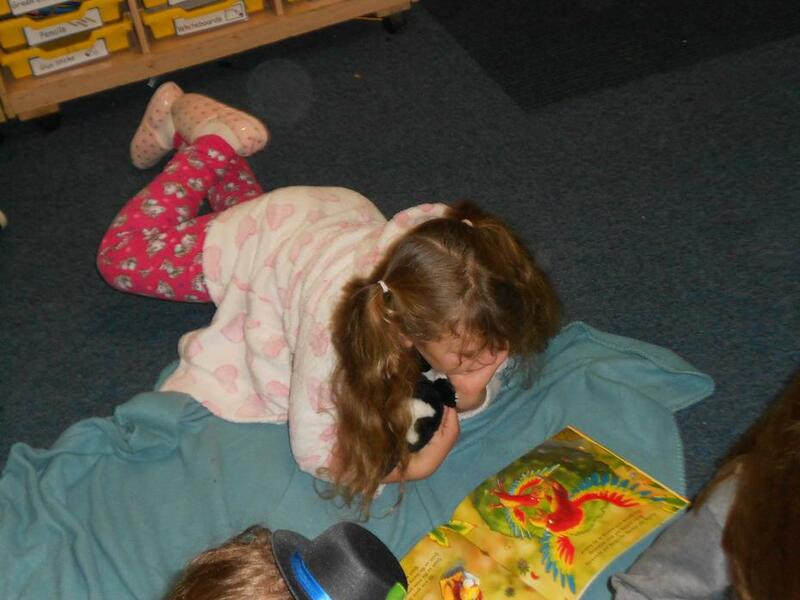 As part of the day children shared picture books with each. 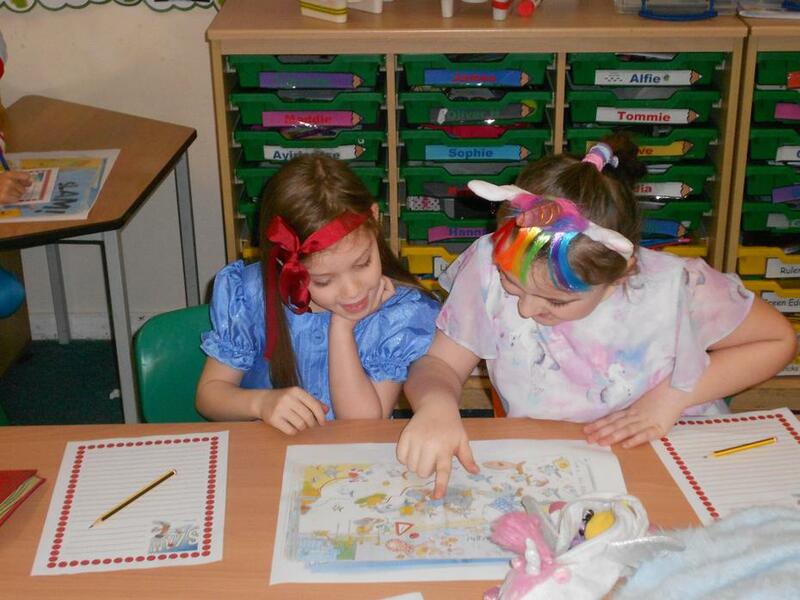 They read the stories to each other discussed what the pictures can tell us about the characters, settings and provide more information. 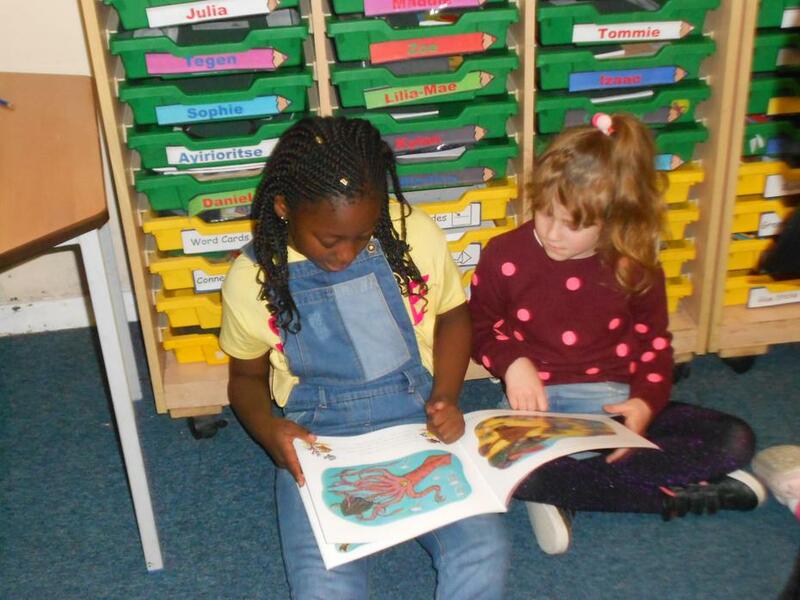 They identified rhyming books and shared which books they liked and why. 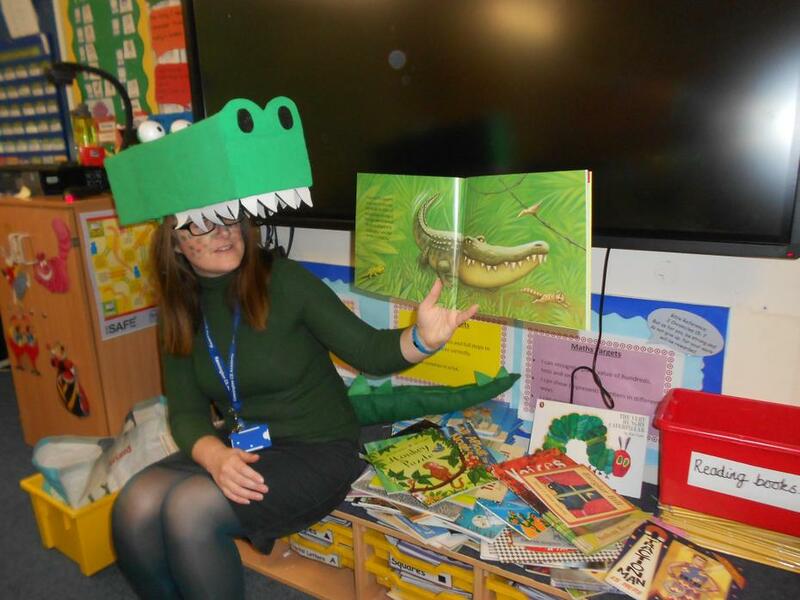 Mrs Bennett even got into the spirit of things and shared a book about the crocodile, while dressed as the Enormous Crocodile.